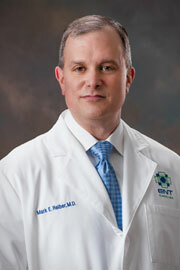 Mark E. Reiber, MD, grew up in Columbus, Ohio and swam competitively as a child. He was active in Boy Scouts and the Exploring program serving as national vice president. He is a graduate and a life-long fan of The Ohio State University. He attended medical school at the University of Cincinnati and completed his residency at Vanderbilt University in Nashville, Tennessee. Dr. Reiber enjoys indoor rowing, distance running, hiking and travel. He loves baseball and has played in a fantasy baseball league with the same group of friends for over twenty-five years. Dr. Reiber and his wife are the proud parents of three teenage children and are members of Parkwood Baptist Church in Gastonia.